The arcball is a tool to rotate objects with the mouse naturally. Imagine a virtual ball that is just behind the screen. By clicking it with your mouse, you would pinch it, and by moving your mouse you would make the ball spin around its center. And the same rotation would be applied to an object in the OpenGL scene! The diagram on the right shows the virtual ball in top view. The black line at the bottom is the screen, and x1 and x2 are two successive mouse positions during the drag. This is shown in 2D but the same principle applies in 3D. The goal is to compute the α angle and the rotation axis. This is the point where you understand that maths are really necessary as soon as you get serious with OpenGL ;) In particular we'll need the Pythagorean theorem, the vector dot product and cross product. glutMotionFunc(onMotion) will call onMotion(int x, int y) for each mouse move when any button is pressed down, where x and y are the screen coordinates. You also have glutPassiveMotionFunc(...) which works similarly for mouse moves when no button is pressed at all. * sphere, return the nearest point on the virtual ball surface. We first convert the x,y screen coordinates to [-1,1] coordinates (and reverse y coordinates). Then we use the Pythagorean theorem to check the length of the OP vector and compute the z coordinate, as explained above. Once we have OP1 and OP2 (here named va and vb), we can compute the angle with acos(dot(va,vb)). Since we're using float variables, there may be precision issues: dot may return a value slightly greater than 1, and acos will return nan, which means an invalid float. The consequence is that our rotation matrix will be all messed, and usually our object will just disappear from the screen! To remedy this, we cap the value with a maximum of 1.0. An extra trick is converting the rotation axis from camera coordinates to object coordinates. It's useful when the camera and object are placed differently. For instace, if you rotate the object by 90° on the Y axis ("turn its head" to the right), then perform a vertical move with your mouse, you make a rotation on the camera X axis, but it should become a rotation on the Z axis (plane barrel roll) for the object. By converting the axis in object coordinates, the rotation will respect that the user work in camera coordinates (WYSIWYG). To transform from camera to object coordinates, we take the inverse of the MV matrix (from the MVP matrix triplet). 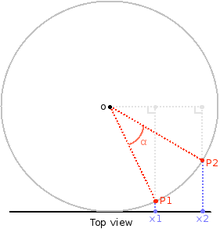 Is the rotation angle proportional to the mouse move? Try to make a move near the border of the virtual ball. The virtual ball will stop rolling when the mouse is too far away. Other mouse controls are possible. For instance, study how dragging with the middle button works in the Blender 3D modeler. Try different roll speeds, by multiplying the rotation angle.